Clay Lancaster, a prolific author, was involved in the efforts to designate the Brooklyn Heights Historic District. After completing his master’s degree, Lancaster moved to Brooklyn Heights and lectured at Columbia University and the Metropolitan Museum of Art. 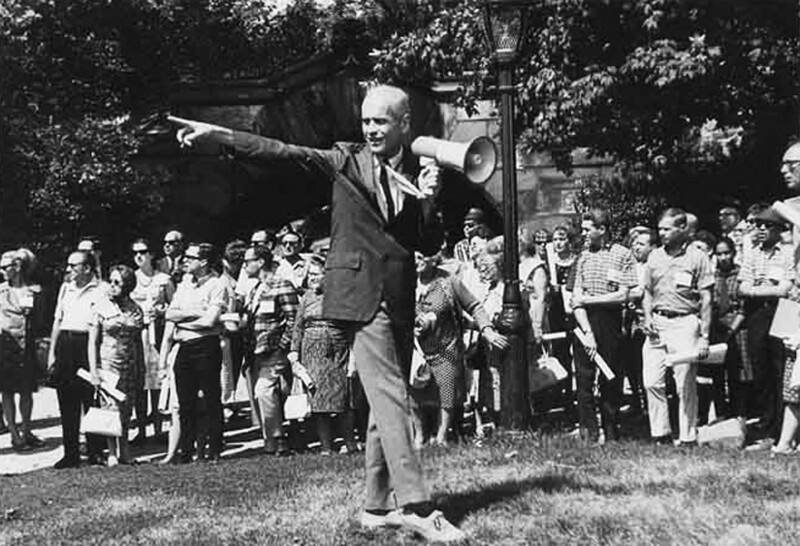 In the 1960s, he became the curator of Prospect Park. He left Brooklyn unhappily in the late 1960s after his apartment was burglarized. He then moved to Nantucket, and subsequently moved back to his home state of Kentucky in 1978. He lived at Warwick, his estate on the Kentucky River in Mercer County, in “blissful solitude.”2 Several years prior to his death, Lancaster founded the Warwick Foundation, an organization whose current mission “is to perpetuate and promote the legacy of Clay Lancaster through education, preservation, and facilitation of cross-cultural understanding.”3 He died on December 25, 2000 at the age of 83, in Harrodsburg, Kentucky. Clay Lancaster was a pioneer in the field of historic preservation. As a scholar of architectural history, he was devoted to the documentation of American buildings, especially in his home state of Kentucky.4 Lancaster was particularly fascinated by the history of the American bungalow. Click here to view the slide presentation that Clay Lancaster used to advocate for historic zoning in Brooklyn Heights during the 1960s. "Like Lexington's Historic Architecture? Wish a Happy 100th Birthday to this Scholar," by Tom Eblen, Lexington Herald Leader, March 29, 2017. Douglas Martin, “Clay Lancaster is Dead at 83; Historic Preservation Pioneer,” The New York Times, 9 February 2001. Anthony C. Wood, Preserving New York: Winning the Right to Protect A City’s Landmarks (New York: Routledge, 2008), page 199. Stanislaw Makielski, The Politics of Zoning: The New York Experience (New York: Columbia University Press, 1966), pages 83-106. Martin Arnold, “‘Old Brooklyn Heights’ Groups Fighting to Preserve Buildings’,” The New York Times, 9 December 1961. Anthony C. Wood, Preserving New York: Winning the Right to Protect A City’s Landmarks (New York: Routledge, 2008), page 219.